There are several ways to look at home prices and home affordability as well as to argue the merits of homeownership versus renting, however, one my favorite metrics to consider along these lines is the relationship between home prices and rental rates. Most home buyers, that are seeking a home to live in, never consider what the home they are considering purchasing would rent for, since that is not their intended use. However, there is a relationship between home values the potential rental income in that there is a tipping point reached when the cost of owning a home exceeds the cost of renting a comparable home in the same neighborhood by too much, there becomes an incentive to rent rather than buy. Along the same lines, if rental rates get so high that, for about the same money, or even less, one could buy the home they are renting, there exists a strong incentive to buy a home. 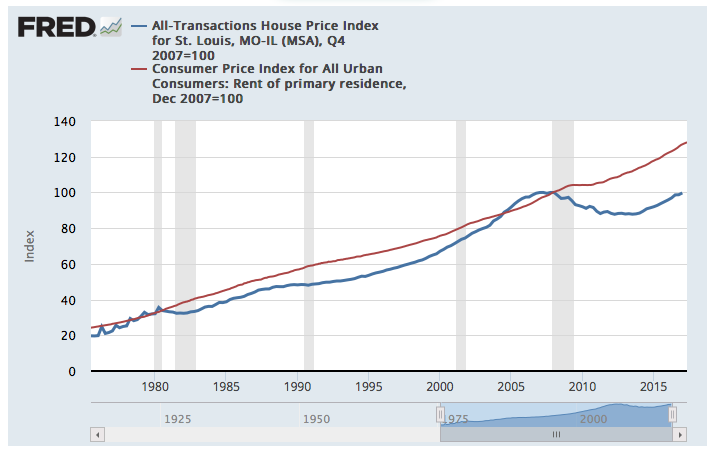 With this in mind, when you look at the chart below from the St Louis Federal Reserve, which shows the St Louis home price index, the blue line, and the Consumer Price Index for Rent, the red line, you can see there is a pretty significant gap between the two. The chart goes back to 1975 and, as you can see, historically the home price index and CPI for rents have increase at relatively similar rates, with home prices lagging slightly behind from about 1980 through around 2004 but, even then, there was a pretty similar trend. As the housing bubble in 2006 approached, you can see the home price trend shot upward and past rents only to fall sharply around 2008 after the housing bubble burst. Since hitting bottom around late 2011, home prices have been trending upward, but, as illustrated, there is a much larger gap between home prices and rents then is the historic norm which is a good thing with regard to home prices. Based upon what I see on the chart (you can click on the chart to be taken to our live, current version which is interactive) I would expect the gap between rents and home prices to close at some point in the near future. This can be accomplished in one of two ways: home prices can rise at a greater rate than rents rise, or rents can fall or remain flat, or, of course, some combination of the two. In either event I think this is good data to support sustained home prices and also shows that buying a home could well be a better investment than renting. Is It More Affordable To Buy Or Rent In St Louis? Homes are affordable; Should you buy? Rent? Do home prices need to fall further?